Do you want to win the LCD screen size war for a fair amount of time? Do you live in South Korea? And more importantly, are you fairly rich? Well, if the answer to these questions is yes, then you can grab one of Samsung’s outrageously enormous “110-inch” Ultra HD TVs for a fat amount of USD 150,000. And for all of you who are not that rich not that into LCDs or not that Korean – read through for fun and imagine a ridiculously large 110 inch wall like tele hanging on your wall. Samsung’s 110-inch television behemoth has now been officially unleashed on the public. The move however is being considered a response to LG’s Ultra HD, a rather similar 105-inch curved LCD launched not long ago. 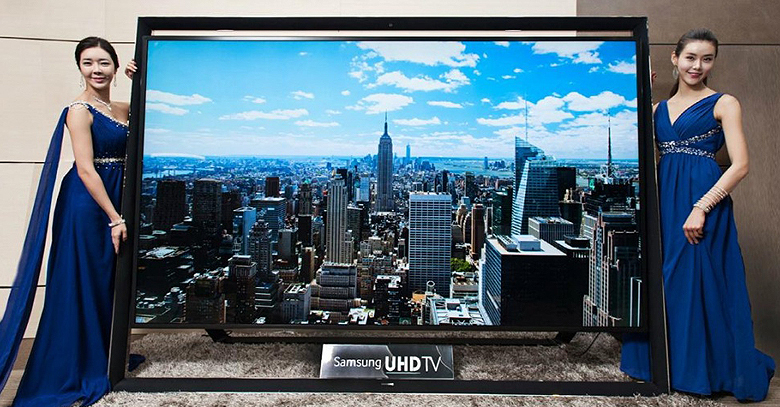 Along with South Korea, Samsung has plans of launching the 110-inch TVs in China, Europe, and perhaps the Middle East. CBS reports further that the residents of Middle Eastern region have even put in more than ‘ten’ orders for the new TVs. Availability for the US and South Asian markets have not yet been officially announced, however with the International CES 2014 lined up for next week in Las Vegas, the launch date for United States can be expected..
Ultra HD TVs (or the 4K TVs, as they are commonly known) have become the leading new TV technology with shipments predicted to grow tenfold in 2014; consequentially the prices are dropping rapidly. Ultra HD TVs include a resolution, that is 4 times that of 1080p HD displays, but the TVs are plagued lack of viable content. On the other hand, OLED TVs, display 1080p content with an astonishing black level and vividly rich color saturation. Hopefully, the same folks who can afford Samsung’s new behemoth can also afford to put some money into pushing for more 4K supportive content, as well as a better infrastructure for delivery of the bandwidth-intensive content. For now, we can only sit in excitement to watch the new Ultra HD unveil in Las Vegas, a Television that measures around 8.5 by 6 feet!